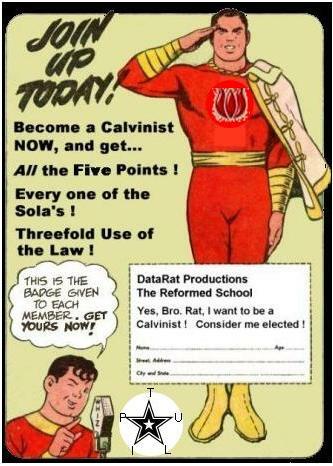 Major Reformation calling all the Elect to battle the forces of General Atonement and the League of Insecure Arminians! Here is a link to the updated post. Here is a link to a printable version. How counter to our culture is this? I just read an article in Time magazine (Reconciling God and Science) about the mapper of the human genome, Francis Collins. I will confess that I was a little disappointed that his perspective, as portrayed in the article was of Theistic Evolution. Particularly his explanation of why he holds to his particular worldview in response to the question, "Did Collins think it possible that all species are products of evolution--except for humanity, which God created separately?" ...the human genome contains nonfunctional elements in the precise spot where they can be found on the chromosomes of lower animals. If God was creating humans afresh, Collins asked, "why would he insert a pseudo-gene that has lost its ability to do anything in the same place that it appears in a chimp?" Barring evolution, "you're forced to the conclusion that God was trying to mislead us and test our faith--and I have trouble with that kind of conjecture." I personally am not forced into this false dilemma, simply because we are unable to understand the totality of the Fall on all of Creation - maybe this pseudo-gene is a charateristic of the physical template corrupted by the Fall? Anyway, I found this article by Mike Gene helpful. reasonable alternative to common descent. What makes this all the more interesting is that because science does not consider intelligent design, it often leaps from similarities to common descent; the plausible teleological alternative is ruled out only by the game rules. And unfortunately for Collins’, he quickly forgets this point.